How to Recover Deleted Videos from Nexus 7? Home > Resources > Others > How to Recover Deleted Videos from Nexus 7? Are you looking for a good way to recover lost and deleted video files from the great Google Nexus 7? Well, you must know that deleted videos are actually still there in your Nexus 7 and they can be retrieved back with the help of some special data recovery tools as long as they haven't been overwritten by new data. Just look no further then, this is the article from which you can get the best solution to recover deleted video files from Google Nexus device, no matter you are using Nexus 7, Nexus 10, Nexus 6, Nexus 5, or others. 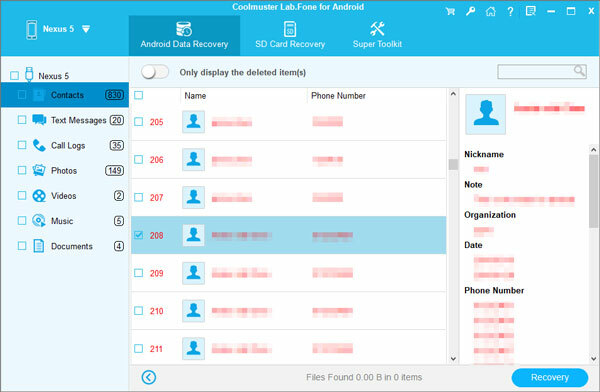 Here we will introduce you use a program called Coolmuster Lab.Fone for Android, which is a professional Android data recovery program to help you recover the lost video files from your Nexus device. 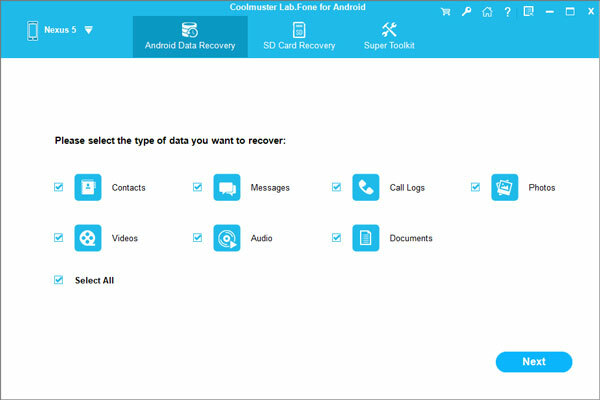 It allows you to recover deleted and lost videos, photos, music, messages, contacts and documents from lots of Android phones and tablets, such as Google Nexus, Windows phone, Samsung, HTC, LG, Sony, etc. To sum up, it enables you to regain lost videos from any Android device in several simple mouse clicks without any loss. Following is the guide to show you how to recover lost video files from Nexus 7. Just click here to get the free trial version. The program comes with Windows and Mac version that are compatible with Windows 8/7/Vista/XP and Mac OS X Mountain Lion/Lion/Snow Leopard/Leopard. After USB debugging enabled, launch the installed Coolmuster Lab.Fone for Android and connect your Nexus 7 to the computer. Then, you will get the window below. The Nexus 7 video recovery software will start to scan your connected Nexus 7 and show all data in the program window. Just open the folder where contains the lost videos and preview them to select those you want to recovery. You can tick the whole category to recover them all to your computer, or you can selectively choose the ones you want to recover and click the button of "Recover" to save them to your computer. Download the trial version of the Nexus 7 video recovery software for free to have a try now!